the origins of the katsinam. lose faith in their own ways of praying. coming, he sent the katsina spirits of Parrot, Tobacco, Crow and Butterfly to see if the Hopis were sincere about learning from them. 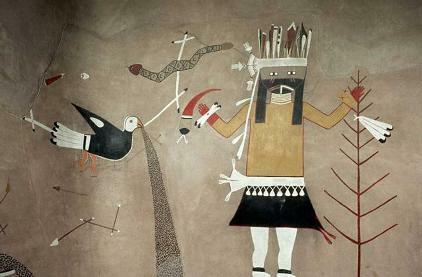 teach the Hopi what they needed to know in order to revive the good things of life. The month of year they came is called Powamuya, purifying moon. still practice Powamuya when the katsinam come to purify people and their place (powatota). "After the purification, the katsinam went away. They went back to their home in Kawestima, to a special place called Kisiyva. It is an artisian spring. katsinam are always there." The katsinam are the clouds. have a good heart. Katsinam are special spirit beings when they come during Powamuya. Hopis believe in katsinam healing the sick by their touch. They also help raise crops by singing special rain songs. in December, when the katsinam return. This cycle is a forever reminder that you're not here alone. You're here for a purpose, and cannot achieve that purpose with negative intentions. prayers and ceremony are done outside, in the middle of cold winter, and during the night. Ceremony teaches humbleness. extra-terrestrials, keepers of the balance of the stars, sun, sky, and moon, and protectors and guardians of human life and everything on earth. Fourth World Doctrine, the ancient life of the Fourth World, is represented by corn and an eternal life.